Anglers, on the whole, are a friendly lot. I often swap lures and items of tackle with my pals and sometimes people who I've never met send me bits and pieces to try out. Quite recently I was sent a few really nice hand-made, 'seatrout' lures by a new friend, Jack, up in Scotland. These little gadgets are works of art and it almost seems a shame to chuck them out to sea - but I do because they look like real fish catchers. 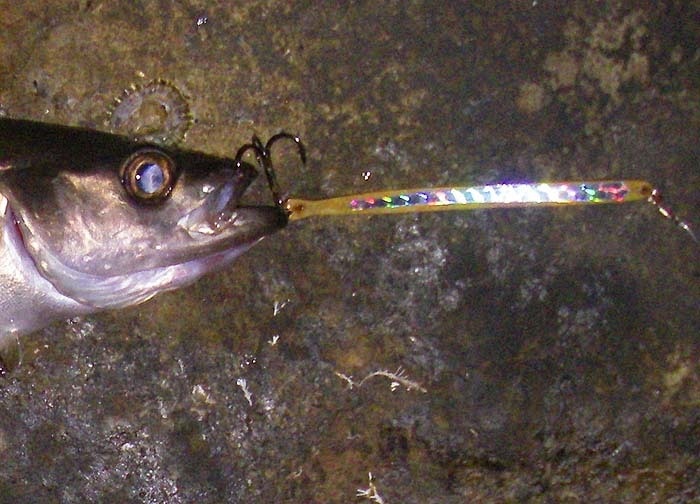 The lures are made from strips of brass, some of them weighted with additional lead and decorated with reflective tape. It was obvious from the moment I first saw them that these would be good fish catchers. On his recent visit to England my pal Alan brought me some flies he had tied in New Zealand. Again they looked superb and I particularly liked a little 'fishy' looking one made from Mylar tube flattened and shaped to look like a small sprat or sand smelt. Anyway, this morning I had a chance to try both of my gifts out. To be honest conditions were not good because although the sea was only slightly choppy there was a very big swell rolling in which I watched for five minutes before descending to my fishing level (better safe than sorry I reckon). There was no problem about fishing but in the prevailing sea conditions I was not too hopeful of catching a mackerel for bait. My first fish was a decent pollack on one of Jack's spoons. I knew straight away that it was not the mackerel I was after because it was pretty sluggish, only livening up when it was under the rod tip. 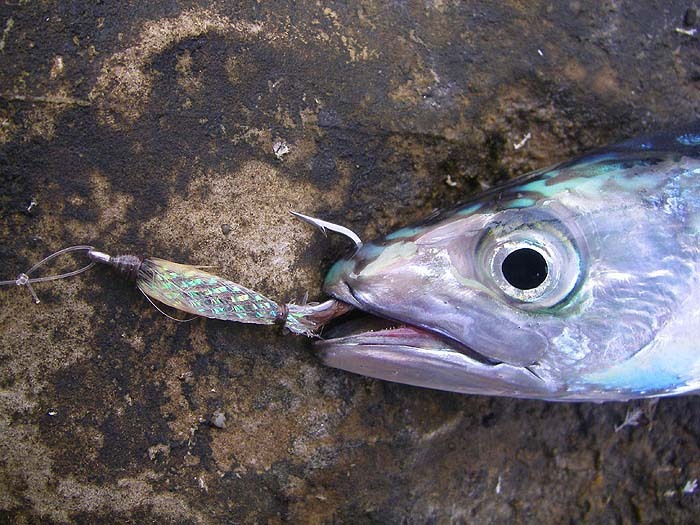 Shortly afterwards (wonder of wonders) I had a small mackerel on an Angel Kiss plug. This was just what I wanted and it went on for livebait. For an hour or so it swam gamely about covering an area half the size of a football pitch but there were no bass interested. 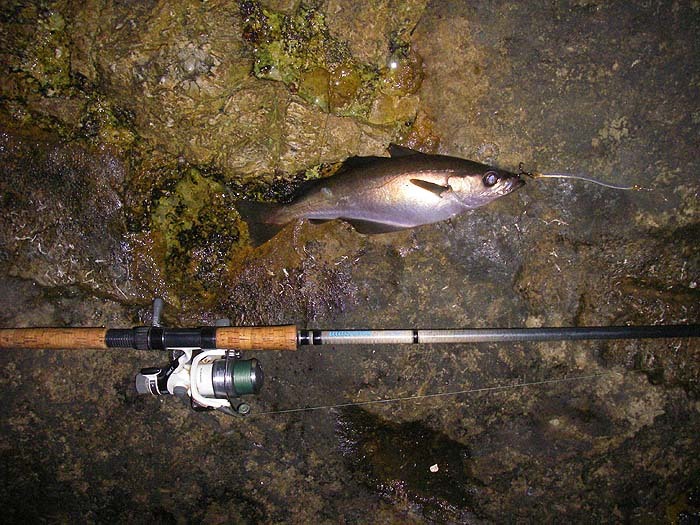 Of course the problem about using a lvebait is that I can't spin or fly-fish at the same time (I hold the rod and work the bait over a big area) otherwise I expect that I'd have caught a few more mackerel, pollack, etc. 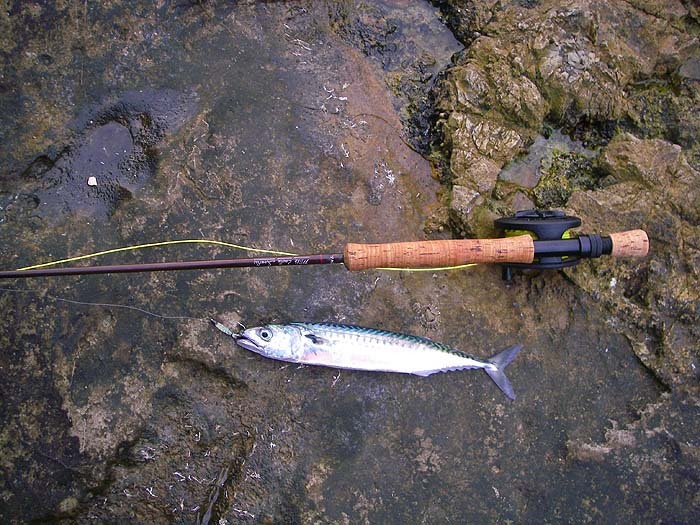 After releasing the mackerel at the end of the session I picked up the fly rod and immediately had a second mackerel on Alan's fly. Both lures were just as effective as I anticipated. They'll be in my box on every trip this year.